Opitutus terrae is a bacterium found in rice paddy soil. 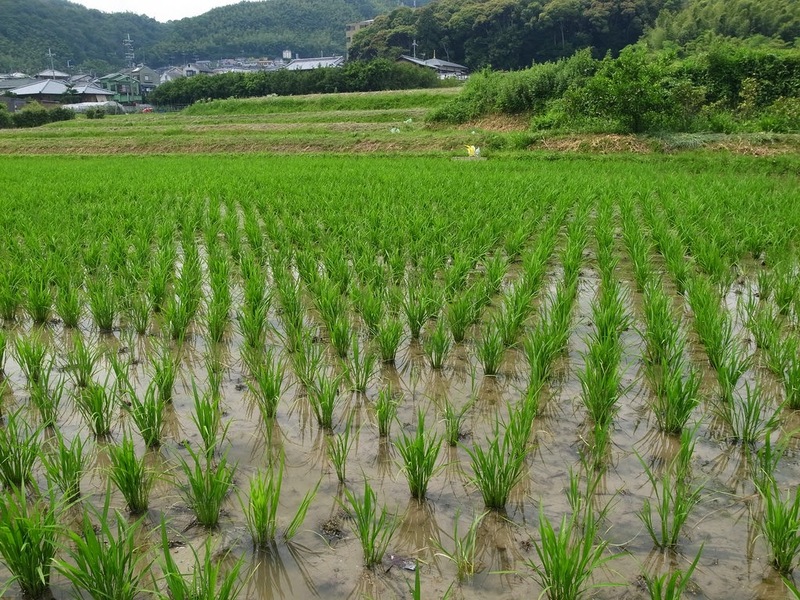 It's well suited to this environment, being able to operate without oxygen (rice paddies are flooded with water, limiting the movement of gases from the atmosphere into the soil) and capable of eating chains of sugar made by rice plants (which are introduced into the soil when paddies are plowed at the end of a harvest). O. terrae was first isolated from a rice paddy in Vercelli, a city in northern Italy. Vercelli is situated in the Po Valley, which contains rice paddies that historically supplied much of the rice consumed by the Roman Empire. Even today, the region surrounding Vercelli accounts for roughly a third of Italian rice production. From an etymological standpoint, Opitutus terrae has an interesting name. While terrae refers to the earth (soil) in which the bacterium is found, Opitutus refers to Ops, a Roman earth and harvest goddess who was thought to make plants grow. This is likely a reference to the bacterium being closely associated with rice and having been first isolated from an important site for rice cultivation in Italy. Sequencing of its genome has revealed that O. terrae carries a gene encoding β-mannanase (an enzyme that breaks down sugars made by rice plants) that is similar to one found in Hirschmanniella oryzae, a nematode (worm) that resides in the roots of rice plants and is commonly found in flooded rice ecosystems. This suggests that the gene may have been shared between these organisms (via horizontal gene transfer) as they inhabit the same ecosystem. O. terrae appears to work closely with methane-generating bacteria (methanogens), which are also abundant in rice paddy soil. It produces smaller bits of organic carbon (acetate, succinate, and propionate) and hydrogen gas from plant sugars, which are then used by the methanogens, leading to methane production (methane being the smallest bit of organic carbon you can get). This association appears to benefit O. terrae, enabling it to grow more quickly. Within its genome, O. terrae has the complete sets of genes required to encode pathways for denitrification (converting NO3- to N2O and N2 via NO2- and NO) and respiratory ammonification (converting NO3- to NH4+ via NO2-). These two pathways are at odds with each other since both are a means of acquiring energy from NO3-. It's important to understand the relative contributions of each pathway since the first one results in nitrogen, an important plant nutrient, being lost to the atmosphere, while the second pathways retains an easy to use form of nitrogen in soil. Bauters L, Haegeman A, Kyndt T, Gheysen G. 2014. Analysis of the transcriptome of Hirschmanniella oryzae to explore potential survival strategies and host-nematode interactions. Molecular Plant Pathology 15(4):352-363. Blengini GA, Busto M. 2009. The life cycle of rice: LCA of alternative agri-food chain management systems in Vercelli (Italy). Journal of Environmental Management 90(3):1512-1522. Yoon S, Cruz-García C, Sanford R, Ritalahti KM, Löffler FE. 2014. Denitrification versus respiratory ammonification: environmental controls of two competing dissimilatory NO3-/NO2- reduction pathways in Shewanella loihica strain PV-4.